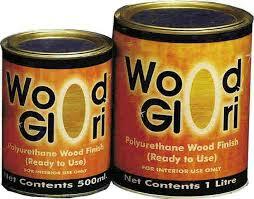 Wood Glori PU is single pack polyurathene wood finish which is very easy to use and offers a new elegant look to your furniture and interiors. Surface must by dry and free from dirt,dust,oil stains,loose particles etc. Apply filler as required. Mix thinner if required.Apply by brush.Apply two coats.Allow 5-6 hors to dry between each coats. Precautions : Keep in cool and dry place.Keep away from fire,children .Close container tightly after use.Keep away from direct heat,sparkles,sun light etc.